Part of the challenge of developing human capital is the need to develop information systems that can help us extend the power of our minds: not only the ability to reason analytically, but the ability to use intuitive processes as well. Ultimately, we need an intelligent partnership between human beings and the information systems that support their work, play, and personal growth. The CyberCon Executive Decision System (EDS) is a concept that MG Taylor Corporation began developing in the early 1980s; however the technology platforms required to execute the concept have only recently become available. We are now developing the applications that will bring the CyberCon EDS to the market in an enterprise-level system. There is still a considerable amount of work remaining in its development and testing, but our plan is to begin rolling out toolkits and modules in the form of aps in 2011. Check back here often for availability and updated status reports. The functioning of the CyberCon EDS depends on all the components working together. None can exist alone and have a full expression of the system. This is not to say that each component must function at the same level of sophistication. The components will, in fact, co-exist while each is at a different level of completion and sophistication. The system itself is subject to the same "rules" of creativity and evolution, as are the projects and processes it manages. The purpose of the CyberCon Executive System is to facilitate the creative process with special emphasis on supporting thought about the future and planning courses of action that respond to and shape that future. The Executive Decision System (EDS) is an idea manager as well as a planning and project manager. The hub of the system is a Knowledgebase designed to provide information to the user, information that is relevant to the task at hand, but that also provides gateways to further exploration of the implications of that task. The knowledgebase is designed to support the user's creative process in dealing with any topic. Further, it is designed to act as a "knowledge capture" mechanism through its interaction with the person using it. Linked to the Knowledgebase are a series of modules. Their main function is to allow the user to explore the relationships between ideas about how the future might unfold and the creation of practical plans to guide action into that future. These modules bring together three of the principle MG Taylor knowledge technologies: the Scenario; the Strategic Plan and its graphic manifestation, the AND MAP; and the Time and Task Management System. The EDS also provides a pathway to the corporate knowledgebase and to other application packages that support the creative process, such as word-processing, spreadsheet, graphics, computer aided design, etc. 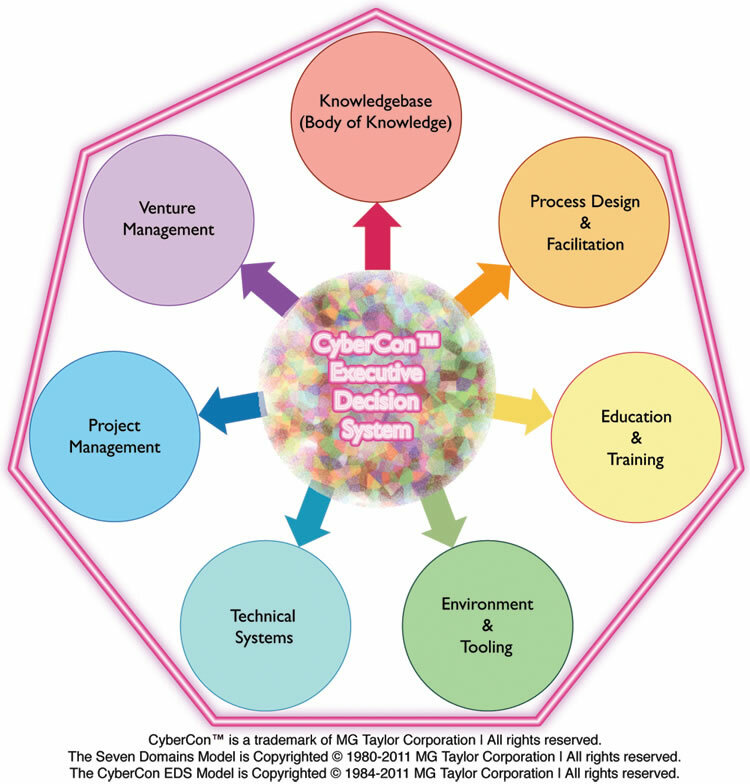 The CyberCon Executive Decision System is composed of seven major modules. At the hub of the system is the Knowledgebase, the main database of information resources. The Knowledgebase Interface is the shell that protects the database and provides the tools to access the data directly or through applications. 6. Time and Task Management Module. Together, they form an integrated environment for the creative exploration of ideas about the future. They also provide the means of programing and managing courses of action to provide the transition, for the corporation or organizations between the present and the future. Finally, the system also provides an intelligent link with the corporate past, which it builds upon by documenting corporate actions as they unfold. The system is, therefore, a historian of actions, providing the chronicle as events occur. Knowledgebase Module - The Knowledgebase and its interface contain the information upon which the six "applications" draw. The Knowledgebase also provides the means of entering and retrieving general information to and from the system. Finally, it provides a means of exploring and creating new ideas, using the creative process and the black box models. 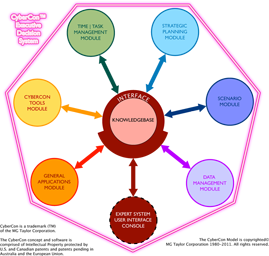 The Knowledgebase interface links the specific work modules, called the principle applications, with the Knowledgebase and application programs that reside "outside" the EDS. It provides the means of manipulating data so that it is compatible with the needs of the work modules and the outside application programs. Ultimately, the Knowledgebase interface manages the expert system aspects of the EDS. For example, in a full expert system implementation, when a particular user signs on to work with a module, the system will call up specific parts of the tool kit that the user profile indicates the user prefers to use. The system might also make suggestions on investigative strategies the user might like to pursue, basing the suggestions on the user's levels of expertise. CyberCon Tools Module - This module contains routines that are used in common by the other work modules. For example, statistical analysis of data will be needed in each of the main work modules. When needed it is called from the tool kit, so that it will not be necessary to have a complete set of code to do statistical work resident within all three of the planning modules. the ability to compare different scenarios and to analyze the implications of variations between the types of events projected, and variations in the timing of those events. The Scenario Module is designed to facilitate the various creative process used by a planner in anticipating how events might unfold through time. Constructing a scenario or group of scenarios about events that will affect our actions constitutes an appropriate starting point in devising a plan of action for the future. The plan will allow us to take advantage of future opportunities and to avoid pitfalls. The Scenario Module is intended to support and enhance the intuitive processes inherent in the act of building a scenario and to provide structured and rigorous approaches to forecasting future events. The module provides structured analytic methods for examining similarities and differences between scenarios, and for using this information to revise the event forecasts within a given scenario. Finally this module allows the events forecast in the scenario to be linked directly to elements in the strategic plan and to show the effects that a change in the scenario event has on the strategic plan action, or vice versa. This is accomplished by identifying key events within the scenario, which will eventually be linked to the goals and objectives in the strategic plan. Strategic Plan (planning module) - This module facilitates the formulation, testing, and maintenance of broad plans of action. The ANDMap technology is supported in a combined Gantt, PERT and decision network form. Formulation of goals and objectives as well as specific activities within the plan is linked to scenario events that affect them. Likewise, events within a plan are linked to specific action within the time and task management system associated with the plan. Through this linkage, the effects of a change in any one of the modules on the other modules will be recorded. Documents that support or explain the plan, or specific actions within the plan, can be retrieved from the knowledgebase. The module supports "what if" computations on a plan or group of alternative plans. The development and alteration of ANDMaps is graphically and analytically supported. The purpose of the Strategic Plan Module is to aid the manager in developing a plan or plans of action based on events formulated in the Scenario Module. The plan that is developed will serve as the main guidance and control tool for the individuals working under the plan. It is the fulcrum that balances the future that the organization sees for itself as expressed in the Corporate Scenario with the need to organize day to day, indeed in some cases hour to hour, activities to achieve the organizational future. This module provides the blueprint for action that the organization will take to achieve its goals and provides the structure upon which the day to day flow of activities (the Time and Task Module) is built. Time and Task Management (planning module) - This module translates the intent of the strategic plan into a day to day scheduling of actions implementing the plan. Specific work packages are broken out showing team membership, the responsible manager, time lines, etc. the rate of completion of various work packages and specific actions are fed back to the strategic plan to monitor plan progress. Possession of a variety of reporting capabilities are a key feature of both the Strategic Plan and the Time and Task Management modules. The Time and Task Management Module uses the activities defined in the Strategic Plan as a framework for creating a day to day accounting of responsibilities to ensure the plan's activities are successfully carried out on schedule. This module provides a more detailed breakout of activities needed to implement the plan. It also organizes these activities from the perspective of the people who will have to carry out the work.